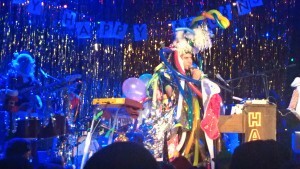 Sufjan Stevens played out the apocalypse at the Bowery Ballroom in New York last night. And I feel pretty good. 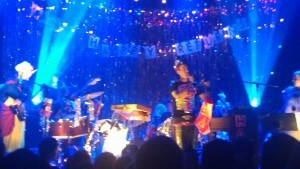 It was a remarkably lovely show with Santa balloons, noisemakers and crazy costumes – a real X-Mess as Sufjan wrote on his shirt – but it was the music….my goodness, the music, that transfixed. He played many different things, many of them Christmas songs, some of them not, like one of the encores: To Be Alone With You. (Click for live clip of the song here.) Sufjan Stevens is a remarkable presence with a profound sense of who he is, his mind working too fast, his talent radiating out, almost embarrassed about it…but not that at all. 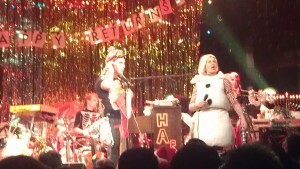 Sufjan Stevens as the Christmas Unicorn. I’m the Christmas Unicorn! You’re the Christmas Unicorn too! It’s a simple thing. It’s a wonderful thing. It doesn’t have to be a world full of guns, floods and death. It really can be something else. We just have to put on our damn balloon suits. That’s it. 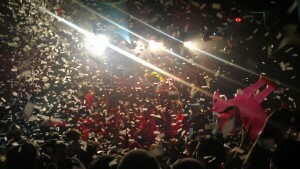 Christmas unicorns and confetti for everyone. 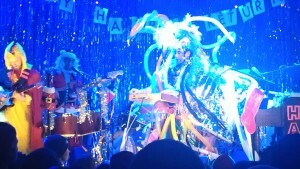 And nominate Sufjan Stevens for President of the Inter-StellarCollective. This entry was posted in music, new york city, writing and tagged Bowery Ballroom, Christmas Unicorn, Sufjan Stevens, To Be Alone With You by McPhedran. Bookmark the permalink.